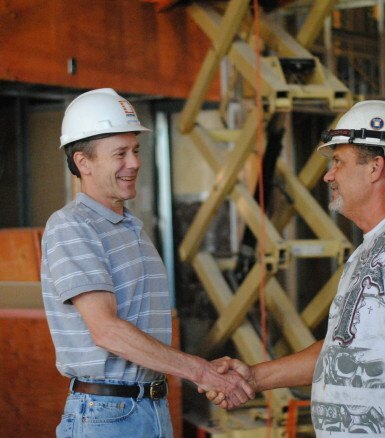 A quality client-contractor relationship is mutually-beneficial. The contractor enjoys repeat business, while the client spends less money and time researching new contactors. That’s why Keystone Construction invests in relationships. Clients want to do business with people they like. It’s a partnership, not a transactional relationship. We advise our clients like we might advise a friend—helping them save money, time and reducing duplicative work. Working to develop a trusting relationship will benefit both parties in the end. It’s sometimes awkward to decide whether the vendor or the contractor should cover the cost of making a change. Many contractors make the mistake of putting profit first over making the process enjoyable for the client. It’s about the journey. We want our clients to come back to Keystone Construction because our people made the construction journey smooth and fun! Even if we disagree, we try to cover unforeseen costs as often as possible. If you’re impatient, the prospective client is going to feel sold. A partnership grounded in trust takes years to cultivate…maybe five years of donating to their charities, sharing meals, enjoying numerous sporting events together, sending them brochures, or connecting them to social media platforms. The more time we spend with our clients the more we understand their needs as a professional and their respective organization. To stay ahead of problems, many members of our team stay connected to our clients throughout the duration of a project. Because our business development team usually cements the relationships, they remain a point of contact in addition to the project manager, to ensure all lines of communication are open to our client. We believe going the extra mile will pay off. Trust us. Clients don’t like surprises. We make sure they know the goals early, even before a deal or budget has been set. Don’t pressure a client to make a deal they’re not sure they can afford. Enjoy this post? To learn more about Keystone’s talented team, read our blog about diversity.